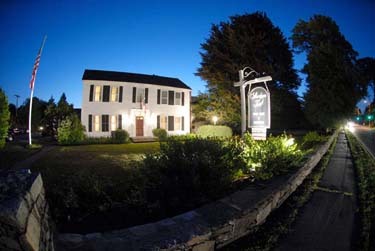 Located 20 miles southwest of Boston, the Sherborn Inn is the restored residence of Colonel Samuel Bullard (1733-1807). Amidst a tranquil country setting in Sherborn, Massachusetts, this authentic Colonial inn offers the perfect blend of historical charm and modern amenities. Our contemporary cuisine and sincere hospitality will ensure the quintessential New England experience for any occasion. Trusted by locals and revered by travelers, the Sherborn Inn combines New England tradition with award-winning cuisine and service. Whether it is a laidback drink and dinner nestled under the exposed wood beams of our Tavern or an elegant meal to celebrate a special occasion in our dining rooms, the 200 year-old historic Sherborn Inn is your next dinner destination. Whether you are choosing the Sherborn Inn for a wedding, a corporate event or a social gathering, our beautiful setting, capable staff and imaginative cuisine ensure a memorable experience. Whatever your vision, we are confident that the Sherborn Inn will exceed all of your expectations. For information please email our Director of Events, Kerry Kirley, at kkirley@sherborninn.com.